Well, friends, the secret is finally out! If you follow along on Instagram, you already know the news: we’re expecting a baby boy in February! We are thrilled, and Kieran is SO excited to be a big brother! Cue all the heart and sobbing emojis. You may have noticed (or maybe you didn’t!) that my posts have been much more sporadic and less frequent these past few months, and that is because I was full-on struggling early on in this pregnancy. I remember being very tired when pregnant with Kieran, but this pregnancy’s exhaustion has been on a whole new level. Maybe because I already have a very active child? Maybe because I’m older? Or maybe it’s the simple fact that all pregnancies are different? Whatever the reason, I was super sick and tired all the time for a good month there. Yuck. As you can probably imagine, the very last thing I felt like doing during this time was making food, let alone styling, photographing, and TALKING about food. So the blog took a backseat to my well being. I needed to just BE. But! Now I’m starting to feel like my normal self (yay for the second trimester relief!) and have been back in the kitchen slingin’ hash for a few weeks now. It feels really good. 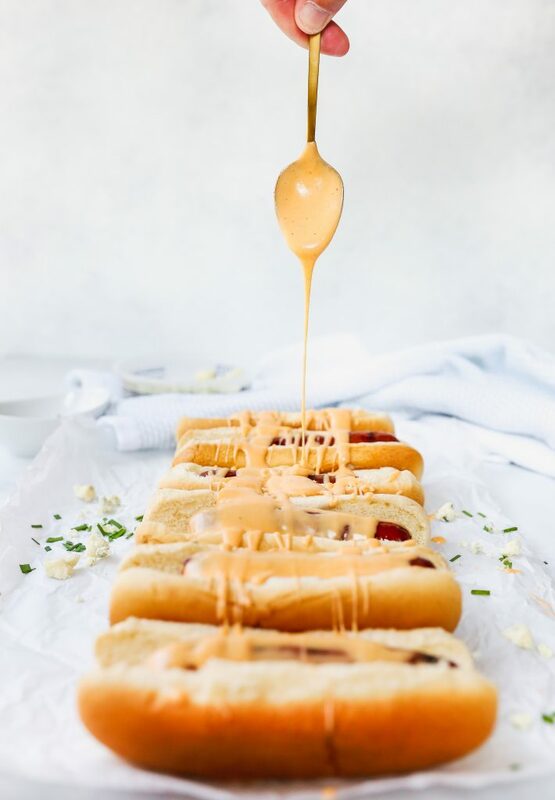 It’s kind of ironic that I am sharing a HOT DOG recipe with you all, having just shared this exciting news. Hot dogs are usually forbidden while you are pregnant, and I don’t think I ate a single one the first time around. 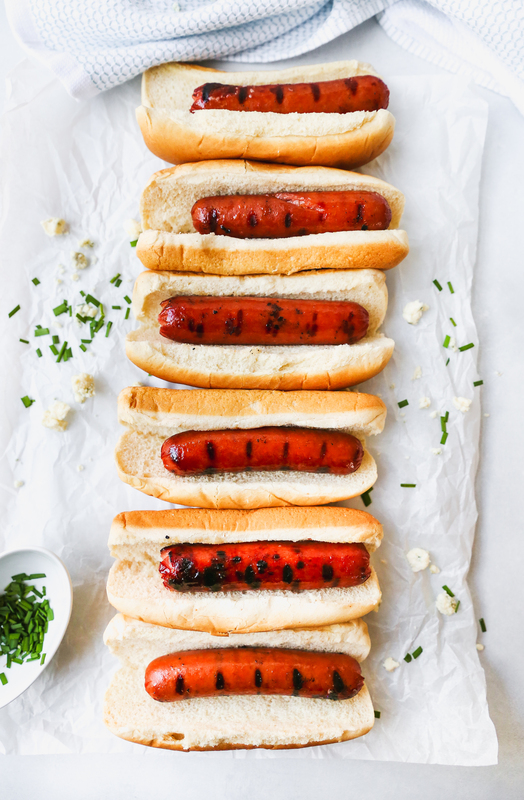 I confirmed with my doc this time that one or two hot dogs is OK as long as they are nitrate-free, organic, and cooked within an inch of their lives. Hah! So that’s exactly what we have going on here. 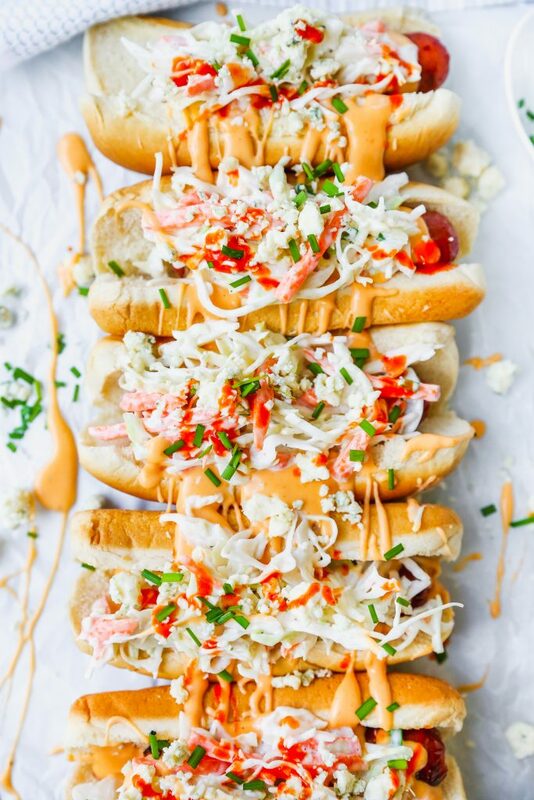 Because did summer even happen if you didn’t have a single hot dog? This recipe is a transitional one. 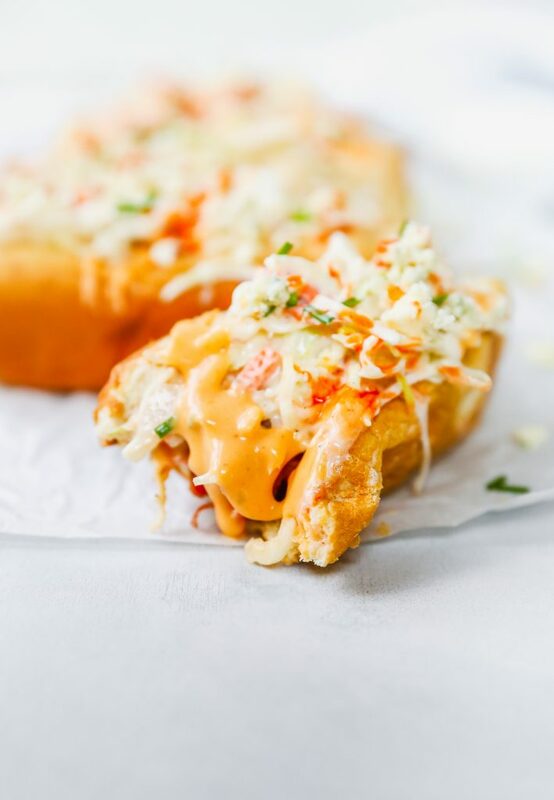 Meaning, we’re got the classic summer hot dog loaded up with the fall flavors of football food: buffalo chicken. Now, there’s no actual chicken involved here, but those classic flavors shine through, thanks to an insaaaane buffalo cheese sauce, and I couldn’t be happier (don’t forget how obsessed I am with buffalo everything. It’s my love language). It’s the perfect finale to summer! With Labor Day happening this weekend (what?!? ), I figured this was the ideal recipe to share. A little bit of summer mixed with a little bit of fall. And the good news is that it is flippin’ DE-LICIOUS. I like a well-done hot dog, pregnant or not, so we grill ours until they are super charred and crispy on the outside. YUM. Once they’re in the fluffy buns, I loaded them up with the buffalo cheese sauce. You guys. I want to put this stuff on EVERYTHING. When I was done styling and photographing these, Dan and I ate the leftover sauce right out of the pot with tortilla chips. 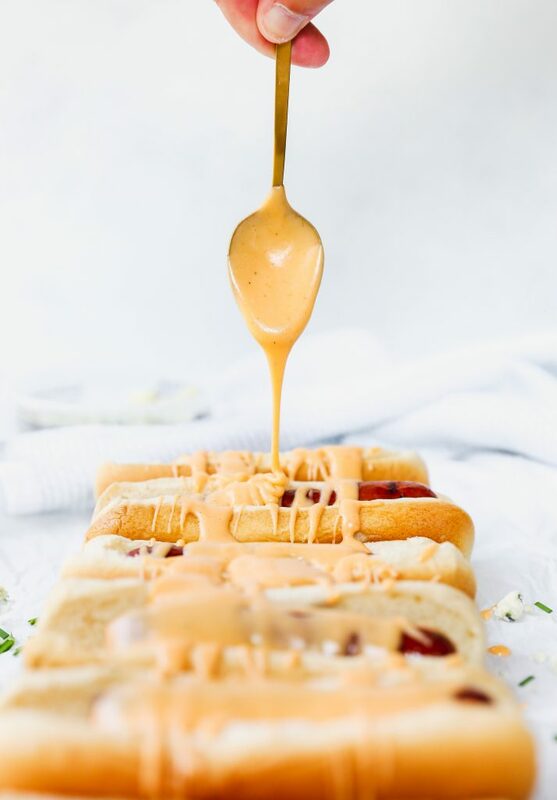 The sauce is cheesy, creamy, a touch tangy, and a lot of spicy! The spice is cut by all the cheese, though, so it’s not something that will blow your mouth up. It’s all well balanced, I promise. 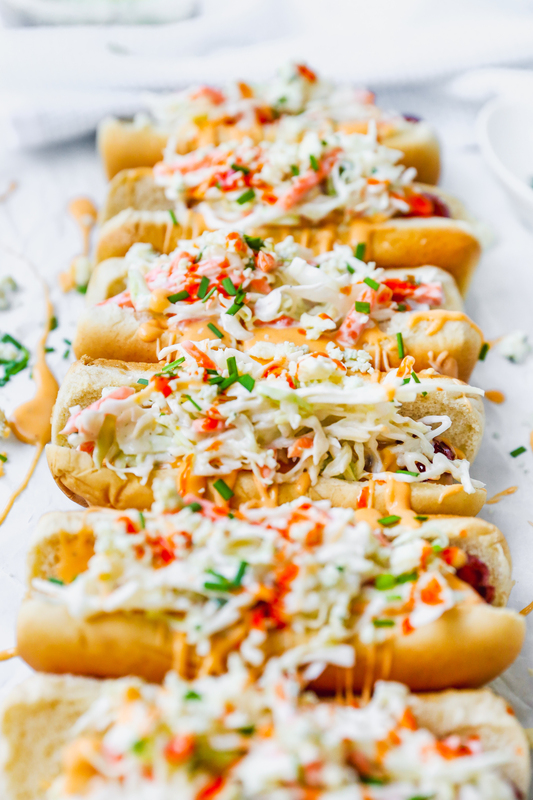 Especially when you top it off with a cooling, crunchy slaw! 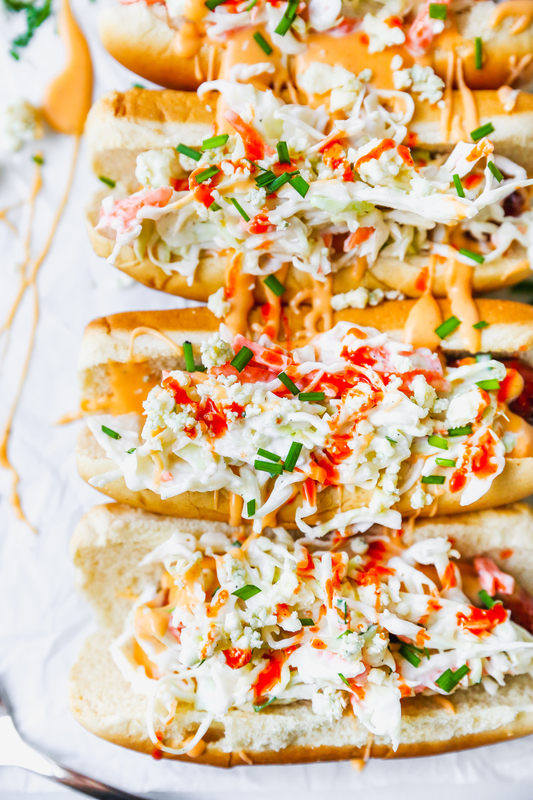 I kept this one really simple on myself (because, hello, I’m making a human being at the moment) and used a store-bought coleslaw mix, but you can TOTALLY make your own. I’d say I make my own half the time. It depends on my mood, how busy we are, and if the other components of the meal are really involved. There ain’t no shame in taking some help from the store, friends! 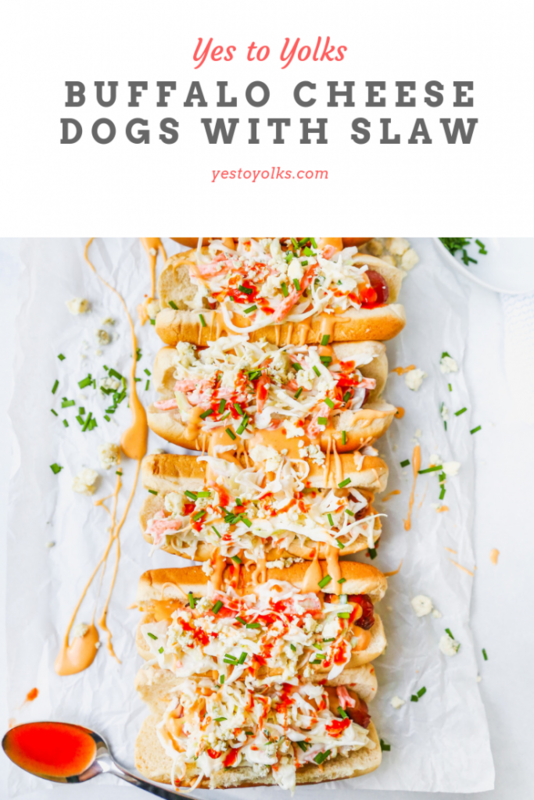 This slaw also has some blue cheese thrown in, just to keep with that buffalo chicken theme. I, being preggo, didn’t eat any of the blue cheese. If you’re knocked up OR just not a fan of blue cheese, feel free leave it out entirely or swap in feta instead! I use feta in place of blue cheese in recipes all the time, mostly because Dan likes the blue stuff in very small doses. Feta is great alternative because it’s super tangy and sharp, like blue. These loaded dogs are the stuff of dreams. I can see myself housing one poolside this weekend, soaking up the last unofficial summer weekend, and I can also see myself devouring one during the first football game of the season! Either way, these are incredible and I highly recommend you work them into your upcoming meal rotation immediately! Melt the butter in a medium saucepan over medium heat. Once it’s melted and starting to bubble, whisk in the flour. Whisk together to create a roux and cook for 1-2 minutes until the mixture turns slightly golden. Slowly add the milk, whisking constantly, and stir until the milk thickens. Add in the cheese and whisk until melted and smooth. Whisk in the hot sauce and dressing and season, to taste, with salt and pepper. Go light on the salt: the other ingredients have quite a bit. In a large bowl, whisk together the mayo, yogurt, vinegar, and sugar. Season with a little salt and pepper, to taste. Add in the coleslaw mix and toss until everything is evenly coated in the dressing. Add the cheese and gently fold it in. Check the seasoning and adjust as necessary. Keep chilled until you are ready to serve. 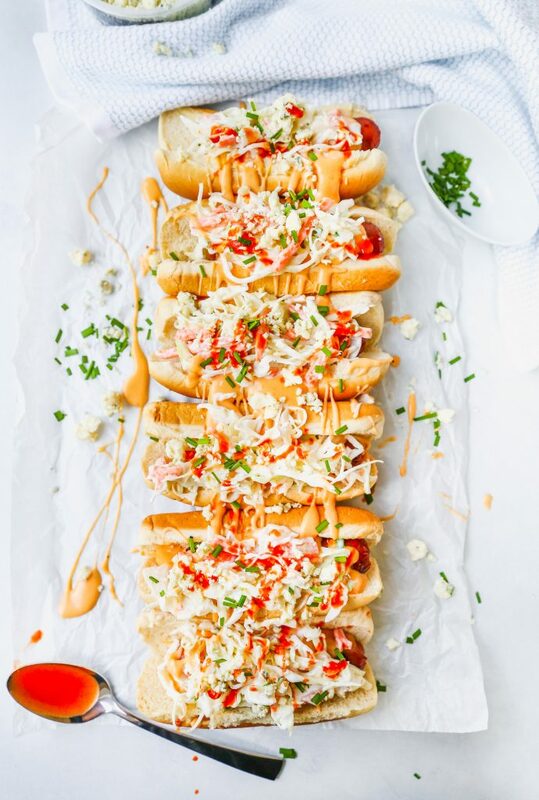 Grill your hot dogs to your desired crispiness (I love a well-done dog). 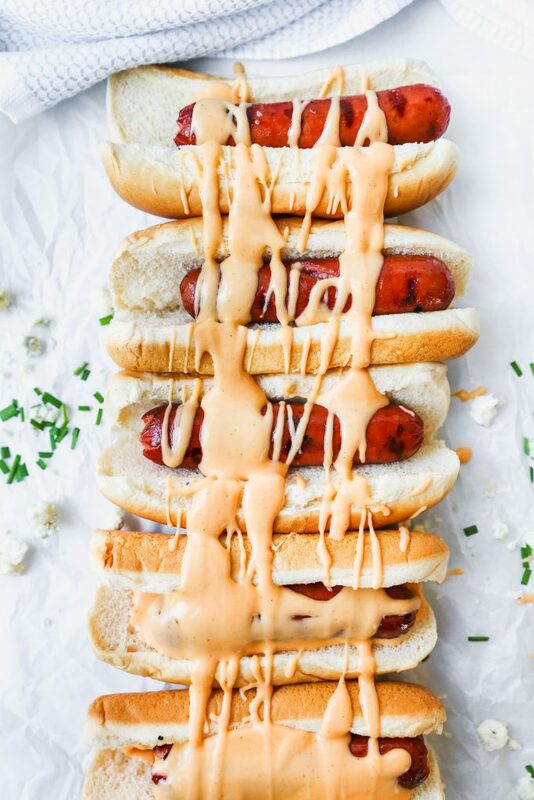 Place the cooked hot dogs in the buns. 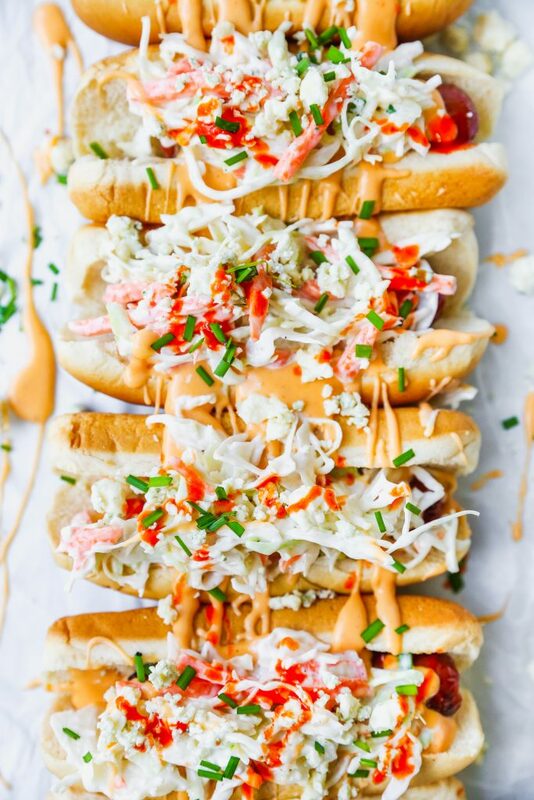 Drizzle each hot dog with the buffalo cheese sauce and then top with the slaw. Garnish with additional buffalo sauce, blue cheese, or chopped fresh herbs. Serve immediately.